Denise Kendrick’s newly released “When Grace Appeared” is the touching personal story of how great sufferings and loss have led a wounded soul to Jesus Christ. “When Grace Appeared” from Christian Faith Publishing author Denise Kendrick is a moving book about her personal testimonies of how God has worked in her life, giving her the wisdom and strength necessary to reach out to her daughter who’s taken away from her, love her enemies, and forgive anyone who has caused her harm. “When Grace Appeared”: a compelling story about a woman’s breakthroughs as she learns to entrust her life struggles to the Lord, especially the challenges she has encountered when she meets her daughter for the first time in years. “When Grace Appeared” is the creation of published author, Denise Kendrick, a caring mother who loves her daughter dearly. Published by Christian Faith Publishing, Denise Kendrick’s new book presents the truth behind her separation with her daughter for a long time; as a mother who suffered from pain caused by her loved ones and abusive husband, she explains the dark past in full detail for her daughter to stop being angry at her and choose to understand the situation. This book is written with a courageous heart—the author is willing to share heart-wrenching accounts of the past just for her daughter to know the truth. View a synopsis of “When Grace Appeared” on YouTube. Consumers can purchase“When Grace Appeared” at traditional brick & mortar bookstores, or online at Amazon.com, Apple iTunes store, Kobo or Barnes and Noble. 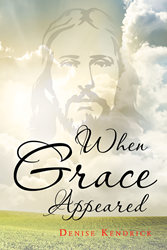 For additional information or inquiries about “When Grace Appeared”, contact the Christian Faith Publishing media department at 866-554-0919.